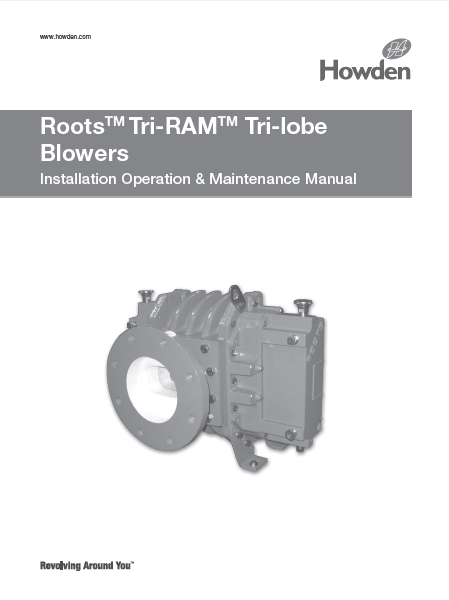 Roots Tri-RAM™ Tri-lobe Rotary Blowers | pdblowers, Inc.
Roots™ Tri-RAM™ Series of tri-lobe blowers is available in 9 different models. All models feature detachable feet and drive shaft extension to adapt to horizontal or vertical configuration. 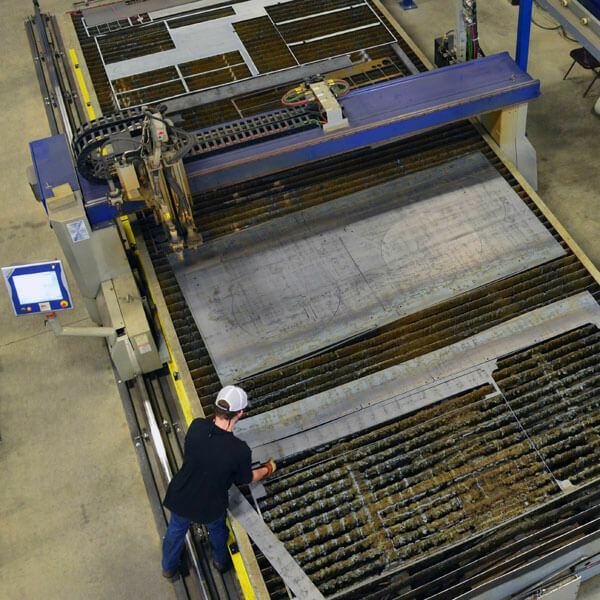 Roots™ Tri-RAM™ Unit is available in 9 different models. 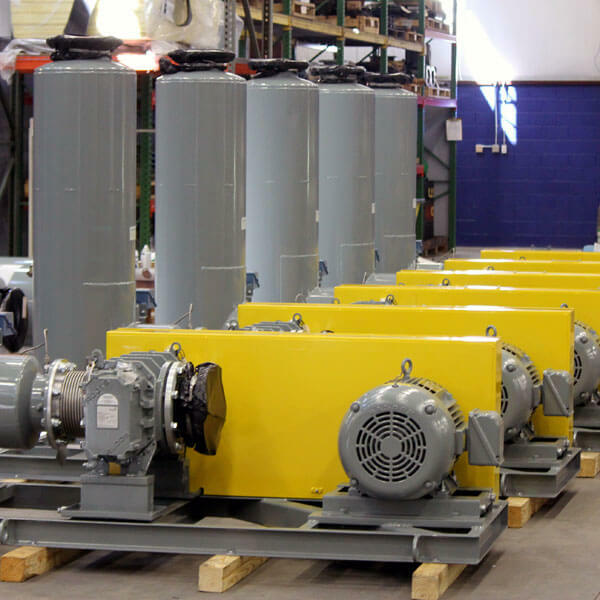 All models feature detachable feet and drive shaft extension to adapt to horizontal or vertical configuration. 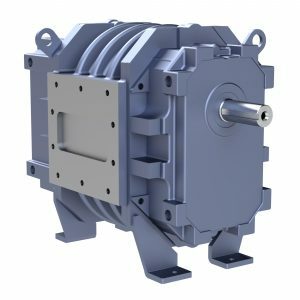 Tri-lobe impellers combined with the Whispair™ discharge design, means quieter operation compared to a conventional unit operating at the same conditions. 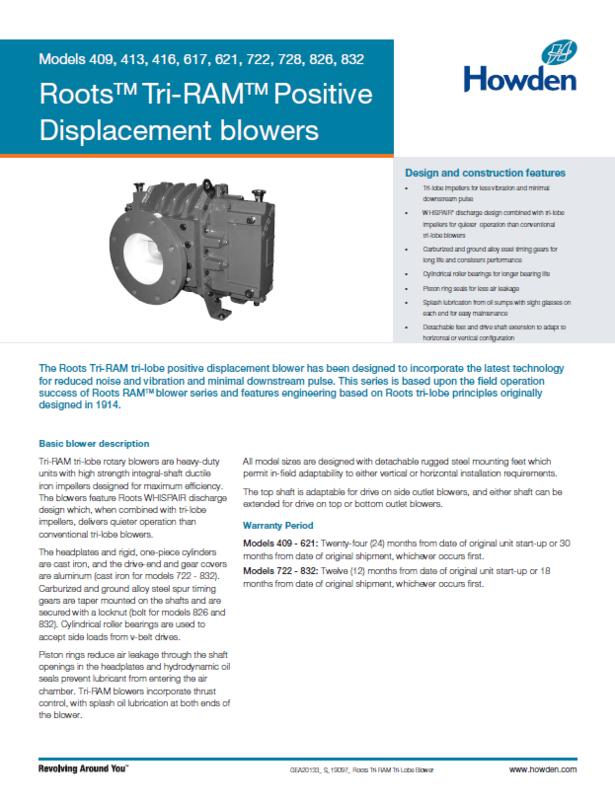 ROOTS™ Tri-RAM™ tri-lobe rotary blowers are heavy-duty units with high strength integral-shaft ductile iron impellers designed for maximum efficiency. 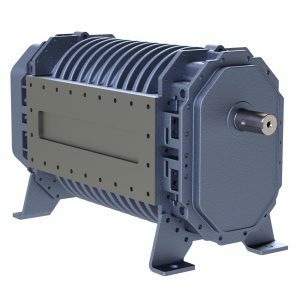 The blowers feature Roots WHISPAIR™ discharge design which, when combined with tri-lobe impellers, delivers quieter operation than conventional tri-lobe blowers. 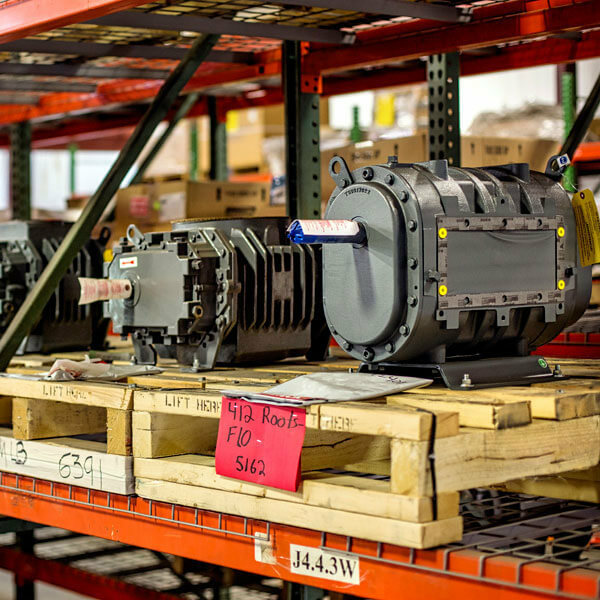 The headplates and rigid, one-piece cylinders are cast iron, and the drive-end and gear covers are aluminum (cast iron for models 722 – 832). 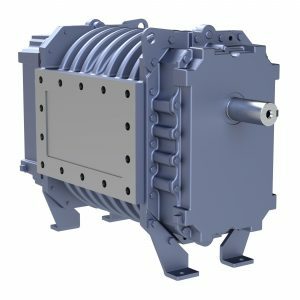 Carburized and ground alloy steel spur timing gears are taper mounted on the shafts and are secured with a locknut (bolt for models 826 and 832). Cylindrical roller bearings are used to accept side loads from v-belt drives. Piston rings reduce air leakage through the shaft openings in the headplates and hydrodynamic oil seals prevent lubricant from entering the air chamber. 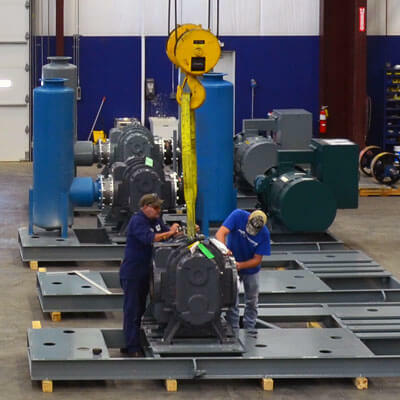 Tri-RAM blowers incorporate thrust control, with splash oil lubrication at both ends of the blower. 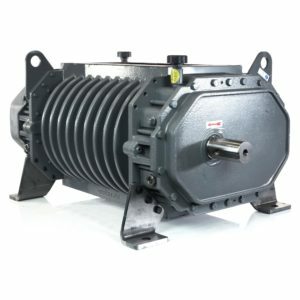 All model sizes are designed with detachable rugged steel mounting feet which permit in-field adaptability to either vertical or horizontal installation requirements. 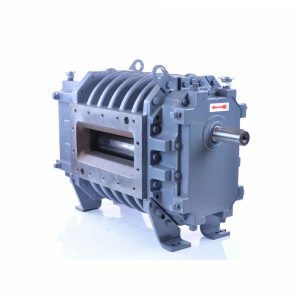 The top shaft is adaptable for drive on side outlet blowers, and either shaft can be extended for drive on top or bottom outlet blowers. Models 409 – 621: Twenty-four (24) months from date of original unit start-up or 30 months from date of original shipment, whichever occurs first. Models 722 – 832: Twelve (12) months from date of original unit start-up or 18 months from date of original shipment, whichever occurs first.